The song is in the key of F major which makes it a little hard for beginners to play along with, so we place a capo on the 3rd fret and play in the key of D Major... a much easier key. Remember, this only applies if you are playing along with the video, otherwise you don't have to use a capo. An easy way to play Dsus4 is to play a D chord and put your pinkie on the first string - 3rd fret... see chart. Remember you are in 4/4 time which means 4 quarter-note OR crotchet beats per bar. There are timing changes throughout the song with changes to 3/4 time and back to 4/4 time. I haven't included them all, as it can become quite confusing. The chords are in sync with the lyrics, so make sure you follow them carefully. Also, if you are unsure of the song, just listen to the video a few times. Once you become familiar with the tune, you will notice where the timing changes occur. The tempo is set at 110 bpm, so if you are using a metronome or click-track, the beat occurs on every quarter-note. Wikipedia - More information about the song with several variations to the lyrics from different sources. Free Online Simple Melody Score - all verses can be downloaded (jpeg or pdf) - Available in English and Esperanto - excellent for any instrument playing chords or the melody line. 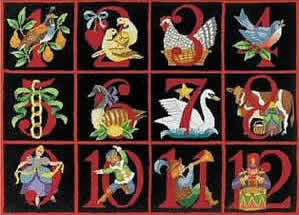 "The Twelve Days of Christmas" chords and lyrics are provided for educational purposes and personal use only.